The names of the road in phase one are all names after the old wards of Cane Hill Hospital, these include such names as Chauce, Olave, Paxton and Salisbury etc.We are also pleased that, after discussions with Barrett Homes and Croydon Council the main spine road was named Cane Hill Drive and not Cane Hill Road as originally proposed. Other names are of people who have been connected to Cane Hill in the past. Below is a link to Cane Hill development. To build flats on the car park of Coulsdon Community Centre (CCC), thus leaving little or no public parking for the Centre and thereby making CCC unviable. Knock down the Calat Centre and built flats on there. No public parking. To build flats on(LGRCP) along with a Health Centre and, maybe, the Library. There would only be 30 to 50 public car parking space if we were lucky. Therefore only 30 to 50 public car parking spaces in total. They move all community activities to the Calat Centre, including the Health Centre and maybe the Library which would save the old Smitham Calat building which already has a hall, which could be used for the Theatre Company, badminton etc and many more rooms than at the CCC and which, being on one floor, was more accessible to the town, transport and disabled. This building could easily accommodate, and more accessibly, the 95% usage rate at CCC would more than cover the activities at the Calat. There would also be over 30 plus parking spaces. In fact, Brick by Brick have agreed with CCC that they will build an additional theatre hall on Calat. To build the flats which were proposed on the Calat site to the CCC site and knock down the less accessible CCC building (with the agreement of CCC board). That those homes built on CCC should be family homes (33 two/three-bedroom house with parking spaces plus two flats at each end). Under the original plans both the Community Centre and the old Smitham School building would have been knocked down – at least one has been saved. Calat is in the centre of town, more accessible and would have parking remaining. There is a separate outline planning application which proposes that the Medical Centre is built in the southern part of the Calat site towards Woodcote Grove Road. Awaiting NHS go-ahead and funding and the RAs have made suggestions on changes to the lay-out which would result in more parking and better access. Brick by Brick have agreed to these changes and there will be 116 public long and short-term parking spaces. Not quite 120 but we are still working on that. The four Planning Application were approved by the Council. Whilst the Residents Associations and the residents would much prefer LGRCP to remain as a much loved car park THIS IS NOT GOING TO HAPPEN, whether Labour, Conservatives or other are in power. The Mayor of London is changing his London Plan (which supersedes Croydon’s Local Plan) to insist that Croydon build 10,000 more homes on top of the 30,000 already in the pipeline and that those are to be mostly high rise flats and little or no parking – public or private. He already objected that there are already too many parking spaces proposed on LGRCP in the current plans. The compromise plans on offer are the best of a bad job and, unless you want worse which is threatened coming down the line from the Mayor then it is up to the residents if they want to keep on fighting. Whilst there are justifiable concerns about the infrastructure problems these and other planning developments already in place will and have caused – ECRA and the other RAs are also concerned -, the proposed Health Centre will at least partially address medical provision. We continue to fight for a A23 exit from Cane Hill. 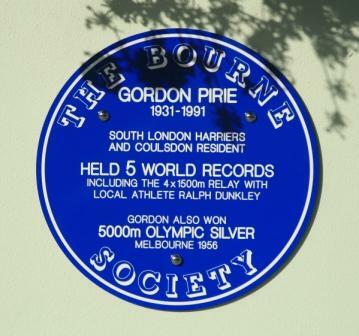 A blue plaque commemorating Gordon Pirie’s athletic achievements was unveiled on 17th October on the Old Comrade’s wall near to the entrance of the South London Harriers Club for whom Gordon ran. The plaque was unveiled by the Mayor of Croydon, Ralph Dunkley, who is also mentioned on the plaque and ran with Gordon in the 4 x 1500 relay world record team and Gordon’s nephew Andrew Munday. Ralph is a local Purley resident. Gordon was a local man who grew up in Coulsdon and attended PurleyGrammar School, developing his skills by running across Farthing Downs and taking part in school athletics beating older competitors. He won silver in the 1956 Olympics, broke 5 world record and once broke the 4 minute mile.